iStudio Publisher aims to fill the gaping hole in the page layout software market that lies between Apple’s Pages ( ) and the pro-level powerhouses, QuarkXPress 3.5 mice ( ) and Adobe InDesign ( ). While the latter two programs are capable of almost any design or production trick, their hefty $600-plus price tags are too steep for anyone but graphic design professionals. And their interfaces are sometimes impenetrable to the uninitiated. Its Freeform Scribble tool and Bezier Curve tool let you draw any conceivable shape, and even run text along the resulting path. You can fill an object with a custom color gradient and even adjust the opacity (transparency) of any object. iStudio Publisher provides helpful tools for fitting an image to its container (iStudio’s name for a picture box), running text around an object, and applying a drop shadow to any object. You can horizontally and vertically scale text, and adjust its letterspacing (tracking). Despite this being its first release cycle, iStudio Publisher has some clever features that Adobe and Quark would benefit from adopting. For example, its image palette first lets you choose a resolution, and then resizes the image to match it. If you choose 300 dpi, for example, your image may immediately shrink or grow in size on the page—but whatever happens, it’s guaranteed to print properly on a press. This feature takes the guesswork out of sizing images and removes a common source of mistakes made by nonprofessionals. The controls for fitting an image to its container are obvious and include an option for tiling a smaller image to fill the container—an interesting design variation. An optional Mouse X-Hair (crosshair) displays a horizontal and vertical line at your mouse location, which is useful when creating new objects. And the program helpfully includes a substantial collection of pre-built common shapes and smooth lines that you can drag onto your pages. iStudio Publisher includes advanced tools for working with graphics and text. 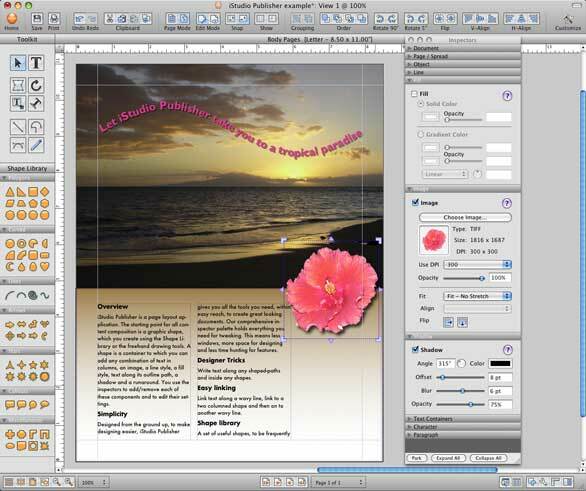 Of course, iStudio Publisher includes many of the capabilities you’d expect in a page layout tool: master pages to place objects that appear on every page; text boxes you can link together to flow text from one column or page to another; basic shapes to import pictures into; lines with arrowheads; a rotation tool; a flip tool; a layout grid; and a pasteboard (or canvas) around your pages where you can store items you plan to use later. You can also distribute or align page objects to each other, and group them. A number of missing features keep the first iteration of iStudio Publisher from truly being a professional tool (but all missing features are scheduled for inclusion in future releases). Here are some things you can’t do right now: create page guides; undo certain important actions; vertically justify text; automatically number pages when printing; access or control advanced OpenType features such as contextual alternates or swashes; create tables; adjust tab stops; manually kern between letters; check spelling; find and replace text; automatically type curly quotes; use ligatures; drag objects between pages or spreads; create or use styles for paragraphs or characters; import text rather than pasting it in; or drag a picture within its container. Although it appears that you can’t create a page size other than the standard letter/legal/tabloid or A3/A4/A5 sizes, you can change the page size in the File -> Page Setup menu. This is a substantial list of missing features for design professionals, but in my view only a few are crippling for average users—adjustable tab stops, automatic page numbers, find and replace, and manual positioning or cropping of a picture inside its container are the big ones. When iStudio Publisher 1.0.4 is updated to include a few more essential features, it will be perfect for people who want more power and freedom than Apple’s Pages ’09 offers. In the meantime, feel free to jump in and start using it now; the program is easy and fun, and the upgrade will be free.